I follow a bunch of housing statistics. But, one stat really caught my eye …The Number of Homes Available for Sale (aka “inventory”) is lowest in 6 years. As inventory drops, sellers regain leverage. What does this mean for the housing market in Raleigh, NC? To begin with, the Raleigh housing market has fared far better than most cities in the country and continues to remain healthy. In fact, many home buyers are ready to purchase and believe that now is a great time to buy. But, the biggest problem that I have run across this fall (2011) when assisting home buyers is the lack of “high-quality” homes available for sale. Most homes currently on the market are located on a busy street, need updating or have an awkward floorplan. Therefore, when “updated” homes located in desirable neighborhoods come on the market, sellers often times receive multiple offers. With the decline in housing “inventory”, we are starting to see the buyer’s market shift back in the favor of the seller. What are foreclosures going to look like in Raleigh 2012? We are expecting an uptick in foreclosed homes hitting the market in 2012. These foreclosures should already be on the market, but they have been caught up in the “red tape” of the foreclosing process. This has allowed the housing “inventory” to reach this low level. However, most of the foreclosures in Raleigh are located on the outskirts of the city where buyers no longer want to live. Don’t wait around. While subtle, the housing market is improving. There are really good deals on the market in Raleigh right now. 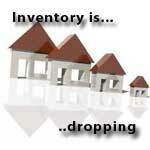 As home sales pick up and the “inventory” drops we will see sellers less willing to cut their price. In addition, mortgage rates will not stay at 4%. I can promise they will go up and when they do…they are not coming back. If employment picks up in 2012, the housing market will improve even quicker. Finally, watch consumer confidence. Once people start feeling better about the economy, the housing market will surely follow suit. Read October’s housing report here.